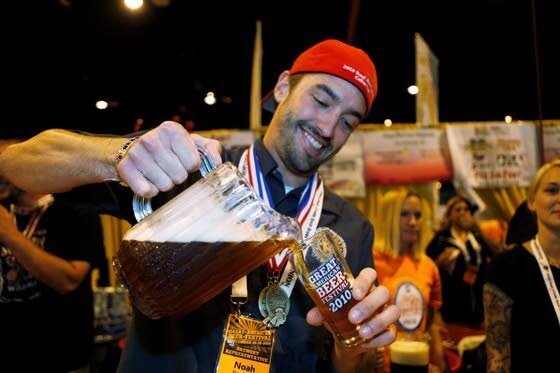 Noah Regnery, from Pizza Port San Clemente in Orange County, Calif., pours a glass of his Pseudo IPA beer at the Great American Beer Festival in Denver. Regnery won gold medals for two of his pale ales. India Pale Ale is among the most popular styles of craft beer, and the IPA categories are among the most hard-fought at beer contests. More than 140 bottles of American-style India Pale Ale sit stacked in donated Bud Light and King Cobra boxes, labors of hop love brewed by a cast of characters that includes an organic chemist, a man with a grim reaper tattoo and a guy who wants to make a beer that tastes like orange sherbet mixed with hot fudge ice cream. During the next nine hours, beer identified only by number will get sniffed, scrutinized, swallowed and spit out by judges at the 29th annual Great American Beer Festival, the world’s largest beer competition. Only one American-style IPA will win gold, making it the craft beer equivalent of winning “American Idol.” Since 2001, no other contest category has been as competitive. “Every brewer wants this one,” as one judge put it.